Adventure21 - Adventure Activities,Outdoor Pursuits and paintball Birthday parties Coniston, Windermere Lake District and Lancashire and Manchester uk. Adventure Activity & paintball Birthday parties Windermere, Bowness, Ambleside & Coniston in the Lake District, Lancashire & Manchester. 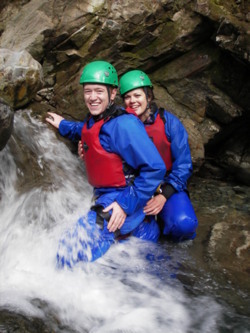 Including Archery, Abseiling, Rock Climbing, Gorge scrambling, Canyoning, Canoeing & raft building. What do you give as a birthday present to that special person who has everything? Adventure activities parties, outdoor pursuits parties or paint ball birthday parties are a great alternative. We organize the best venue to suit you and supply all the equipment. All you need to do is turn up. Choose from any of the birthday party activities on our outdoor pursuits activities pages below or try out our new private woodland paintball site near Torver in Coniston. If you require birthday party accommodation, catering or evening entertainment for your birthday party celebrations we are happy to advise you on the best options. We can even supply the birthday cake and candles! You've been bowling, hired a bouncy castle, done the swimming and football party, whats next??? Why not try one of our Junior adventure activities birthday parties. As with the adult parties we organize the right venue to suit you and supply all the equipment. Choose from any of the activities on our activities pages below or see actual birthday celebrations photos in our gallery section. catering, cakes and party bags can be arranged, or just bring your own, please ask for a price on booking. Dear Dave, I just wanted to let you know that we all had a fantastic time on Saturday doing archery and rifle shooting at Coniston for my Birthday (not only because I beat the rest at archery!). The location was lovely, our instructor, Mark, was brilliant (please pass on our thanks) and it was great fun. Thanks to you too for the booking, etc. Birthday rock climbing, Birthday mountain and hill scrambles, Birthday abseiling, Birthday , Birthday open Canadian canoeing, Birthday canoe sailing, Birthday canyoning, cycling, Birthday gorge scrambling, Birthday kayaking, Birthday mountain biking, Birthday sailing, knot tying, Pontoon and rope bridge building, Birthday scrambling, Birthday waterfall climbing, Birthday orienteering, navigation, Birthday hill walking, Birthday archery, Birthday rifle shooting, Birthday Paint balling, Birthday raft building, Birthday team building, survival days, culvert scrambling, Birthday Tyrolean traversing Birthday fishing, Birthday Bush craft day courses, and Birthday bushcraft and wilderness camps. We have many Outdoor activities and Adventure pursuits Birthday party venues for boys and girls within easy reach of Lancashire, including Chorley, Preston, Blackpool, Wigan, Blackburn, Bolton, Chorley, Rivington, Anglezarke and Manchester and in Cumbria, particularly around the North Lake District, South Lake District, East Lake District and the West Lake District areas, for example Coniston, Ambleside, Windermere, Keswick, Hawkshead, Kendal, Bowness, Ullswater to name just a few.